When Polaroid stopped making their classic cameras and instant film, a lot of folks where left with a void in their photography fun. A company picked up some of the need by producing their version of the film packs, with mixed luck. We have a good size group of Polaroid Camera owners in the office and it seems like one film pack to the next has significant results. Some look at that as the fun of film, others see money out of pocket with little show for us. 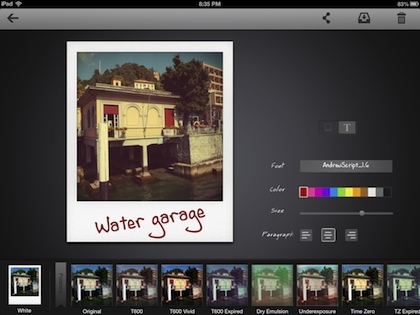 An app a few of the iPad users have been using is Instant. 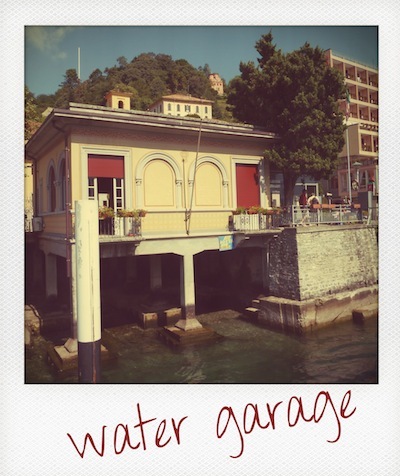 The app is for iPad only, and not only creates Polaroid looking images, it is also a place to display those creations. 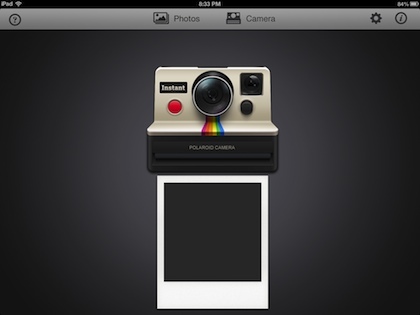 With Instant, you start with a screen of the classic Polaroid One Step camera. Tap the Camera option, take a photo with the iPad and watch the print come out of the virtual camera. 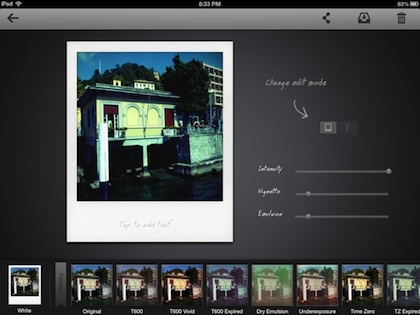 If you choose to use a photo from the iPad’s photo library, the option to crop to the square area of the classic instant film print is provided. After a while, the image on the photo paper from the Instant camera ‘develops’ to reveal the photo taken. Just like everyone gathering around the photo paper when it came out of the classic Polaroid. This is more fun when using the iPad camera to snap the photo than choosing one from iPad’s photo library. Double tap the image to be taken to the editing tools screen. 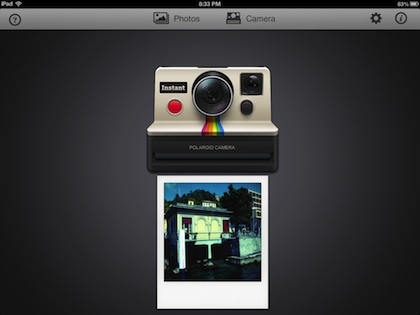 Instant offers a selection of Polaroid effects at the bottom of the screen to swipe through and choose. The cover all of those situations users of the real Polaroid Instant cameras used to have to live with like when it was too bright outside or the film had gotten warm. To the right of the image is three sliders to tune the chosen effect a bit. Tap the text area on the lower part of the photo to type in a few words if you like. Use to fingers to expand/collapse, locate and twist the text to get the effect your looking for. On the right there is a slider switch (took a lot of taps to figure out the button slides) to change the photo enhancement sliders to text tools. The Fonts are chosen by swiping side to side in the ‘font’ window. Instant offers a variety of ink colors and a slider to adjust size as well. The finished image out of Instant is as ‘vintage’ as you like. If you don’t like the direction of your creation, tap the trash icon. 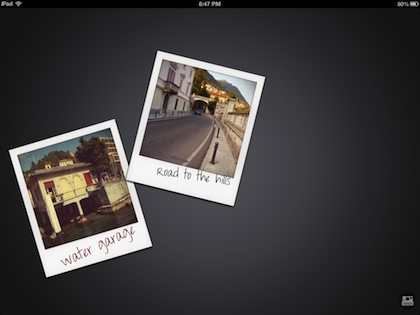 Saving to the iPad’s photo library is the next option in the upper right. You can also share with friends on the popular social networks directly from the app. In the settings area, you can choose if Instant uploads your images to Instagram with or without the classic white boarder. Selecting the arrow in the upper left corner takes you back to a photo display area. 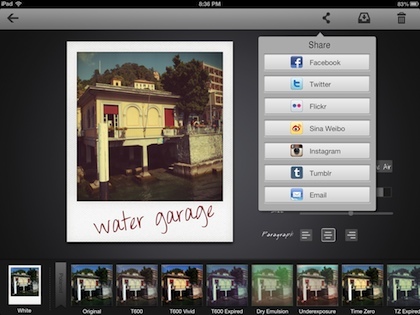 Instant lets you move the images around, and twist to match the ‘pile of photos’ your looking for. 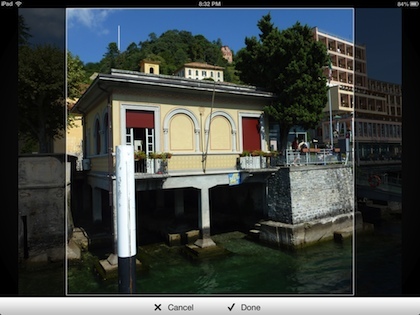 To return to the camera for creating more, select the camera icon in the lower right corner. You can quantity of photos through the Settings area.